Greens Improving Rapidly After Aerification! 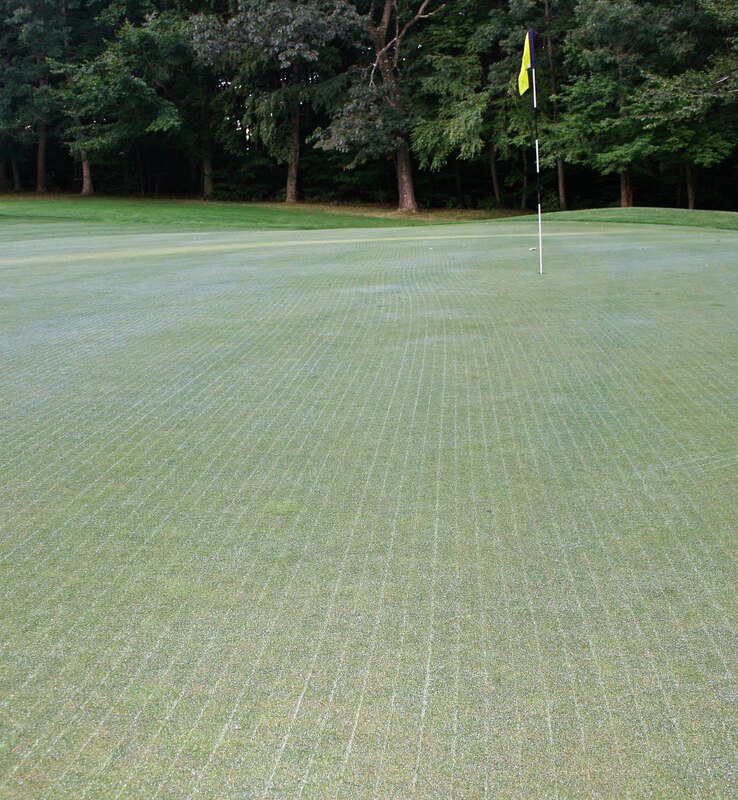 It has been one week since we aerified the greens. I am very pleased with the rapid rate of turf recovery. Playability will improve significantly in the next few days. The days that immediately follow aerification make it difficult to achieve a clean cut because of the sand topdressing. 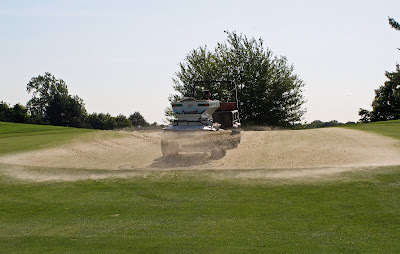 While the sand helps with long term playability and improved health, the short term result is a poor turf cut. 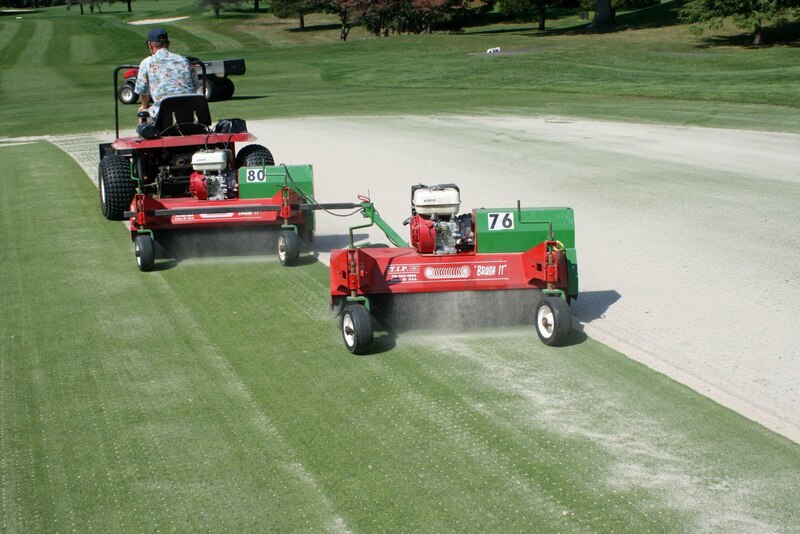 The sand wears the mower blades almost immediately during a mowing. We are already on our third blade sharpening in one week. Under normal conditions we sharpen blades once per week. 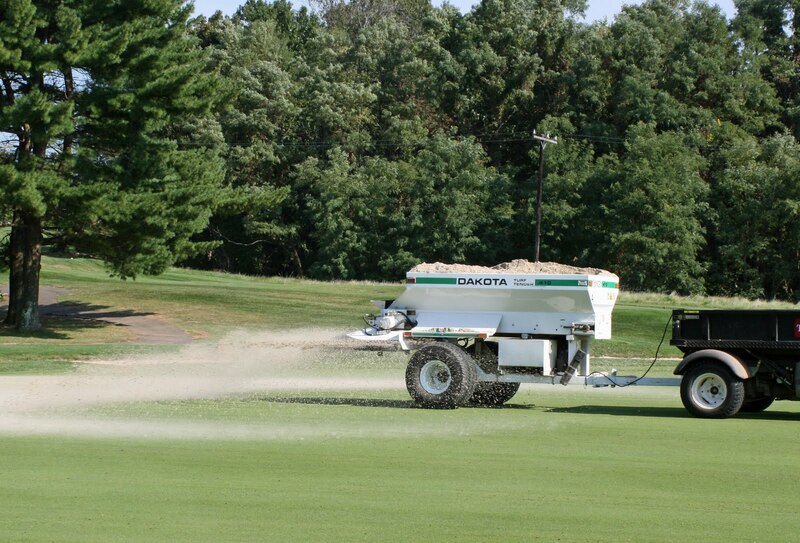 Other factors that influence the post-aerification playability are fertilization and growth regulator applications. 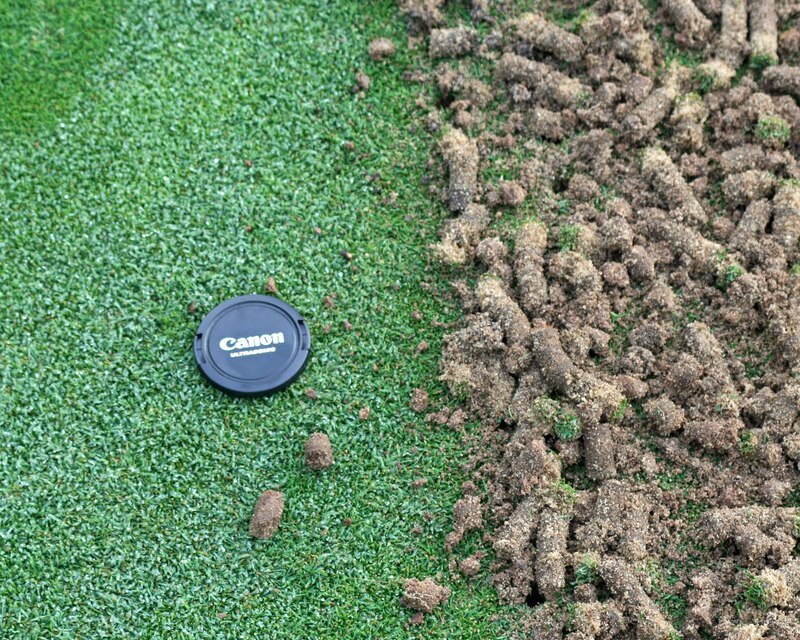 Before, during and after aerification we increase fertilization and stop applying growth regulators. This promotes rapid healing and leaf growth. 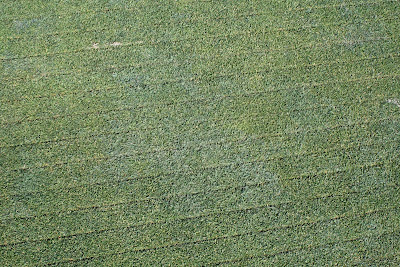 Once I am confident we have achieved substantial recovery, we reduce fertilization and begin applying growth regulators again. We made our first growth regulator application yesterday. The substantial rain we expect in the next twenty four hours will further enhance recovery but will limit our ability to mow. I expect us to be able to mow by Saturday morning at the latest. We are turning the corner and the putting surfaces will markedly improve over the next few days. 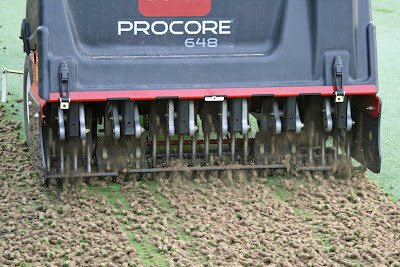 We are being more agressive with the aerification of the practice green. We used 5/8 inch tines instead of the 3/8 inch tines used on the other eighteen greens. We also used a closer spacing. We need to be this aggressive so we can continue to improve turf health and get the best results possible with our overseeding plan. 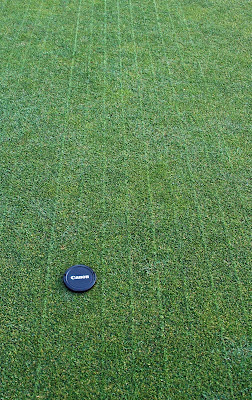 Everything we do between now and May 2011 helps to ensure the greens success next year. We are right on track! I am confident that the practice green will be much improved next season and play just like the rest of our greens. I thank you for your patience. I am very pleased with our progress! The two days with the course being closed are always very productive! 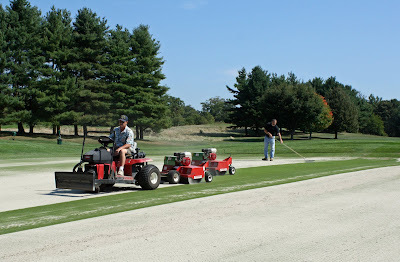 We will complete all green and approach aerification, including overseeding and topdressing. 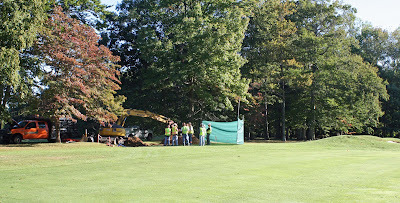 We are also renovating all bare spots on fairways and green complexes. This is the perfect time to rejuvenate weak areas for next season. 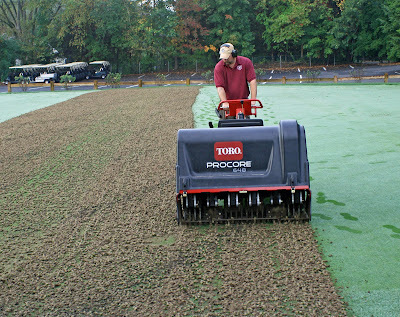 Aerifying of Greens Began This Morning! 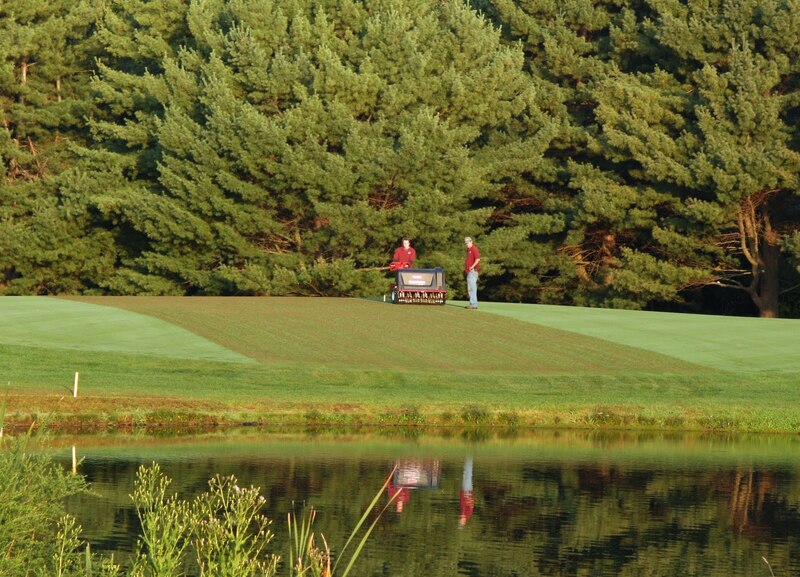 Greens aerification is in full swing this morning. The course will be closed today and tomorrow so we can complete the job as quickly as possible. The faster we get it done, the more rapid the healing process. 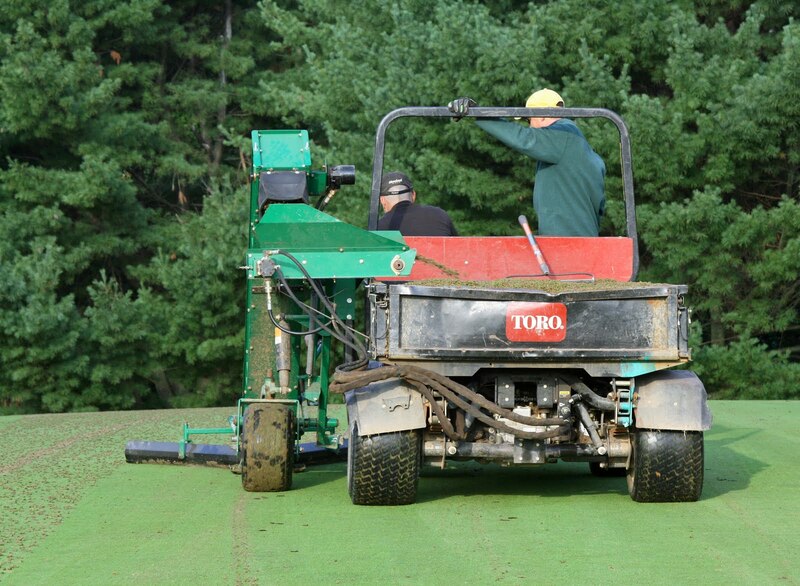 The use of 3/8th’s inch tines, instead of 1/2 inch, will also help the holes close quicker. 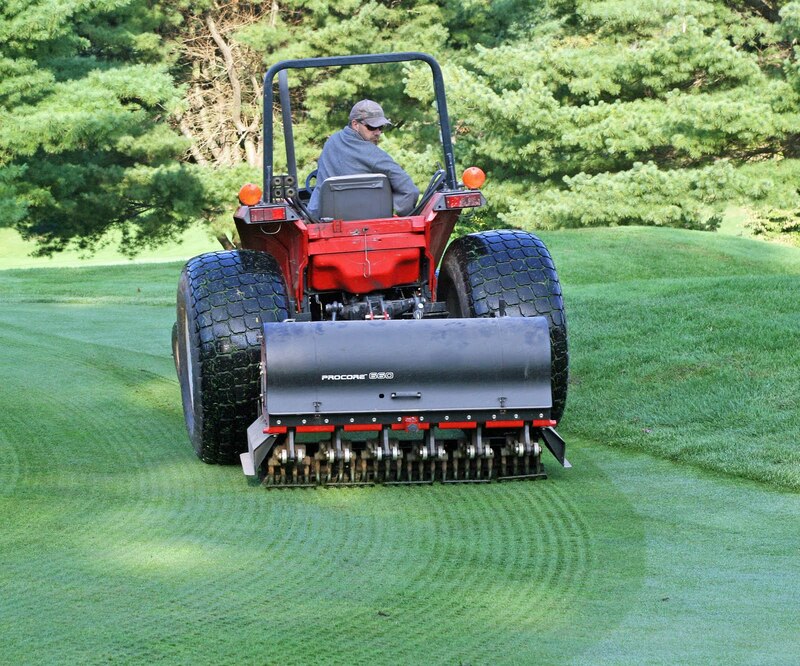 I addition, we are aerifying the approaches and weak spots in fairways. 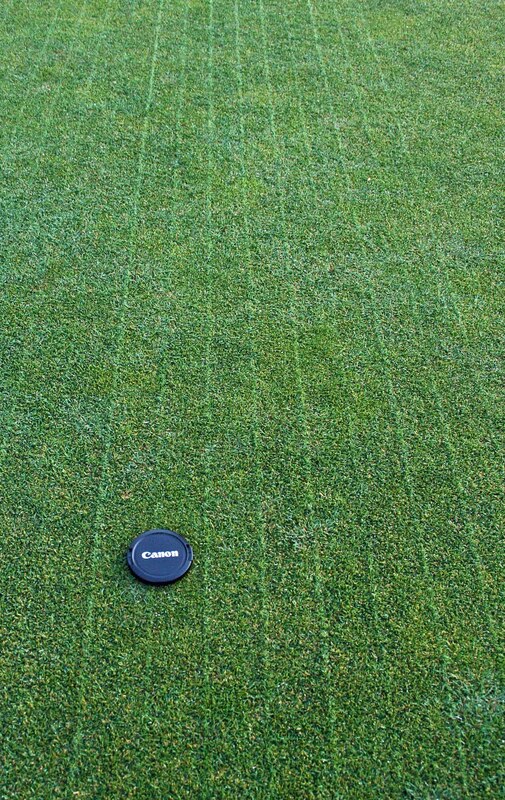 Thin turf in all areas will be overseeded. 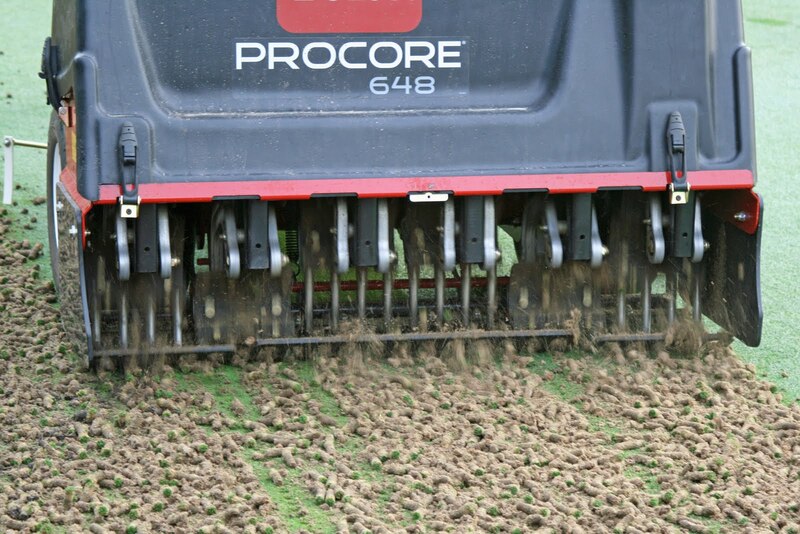 We Are Aerifying Greens Next Week! 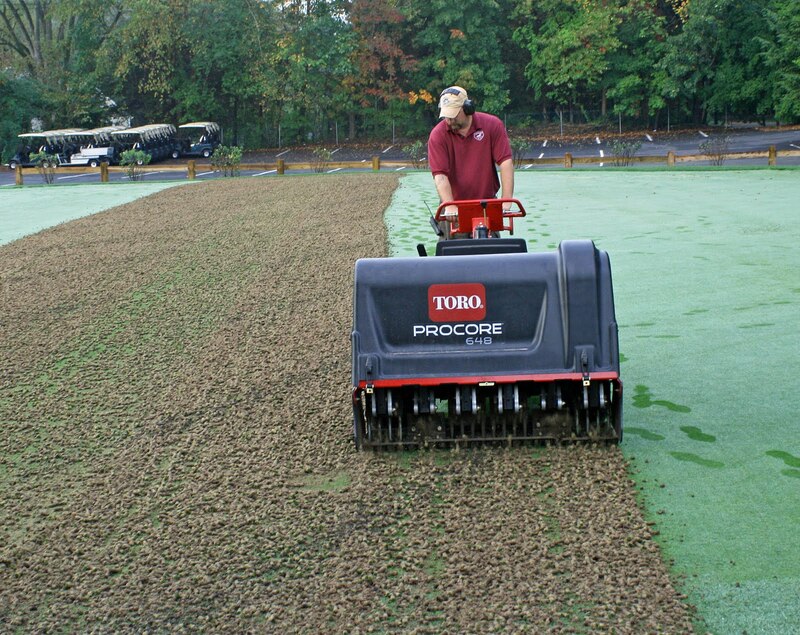 We will be aerifying greens next week starting on Wednesday, September 22nd. 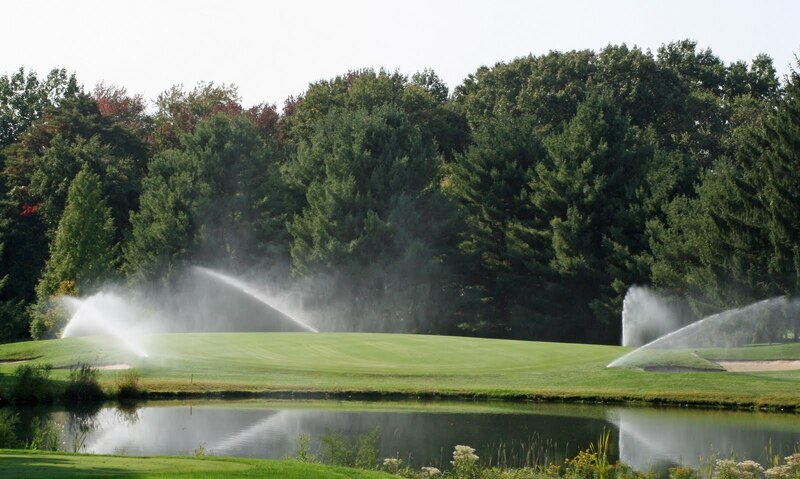 The course will be closed both Wednesday and Thursday. 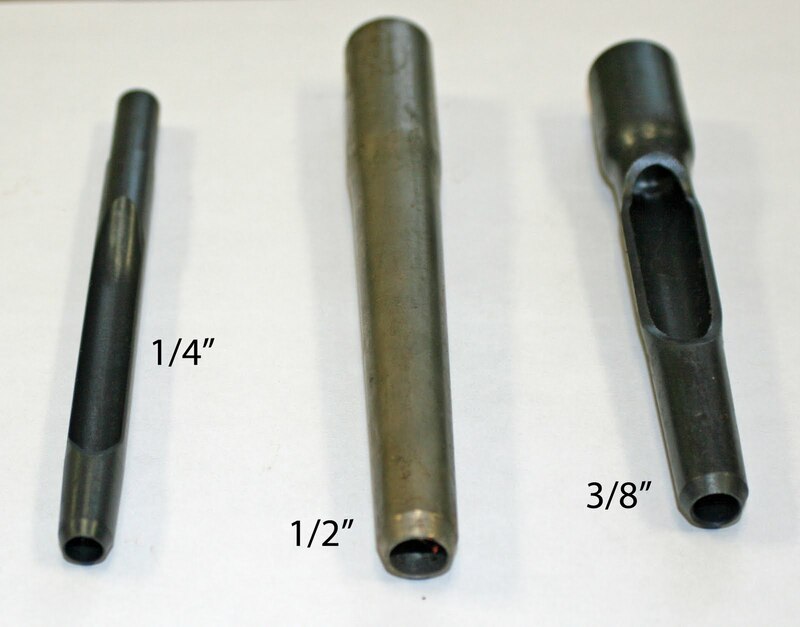 The September aerification will be performed with 3/8 inch tines (see photo below). 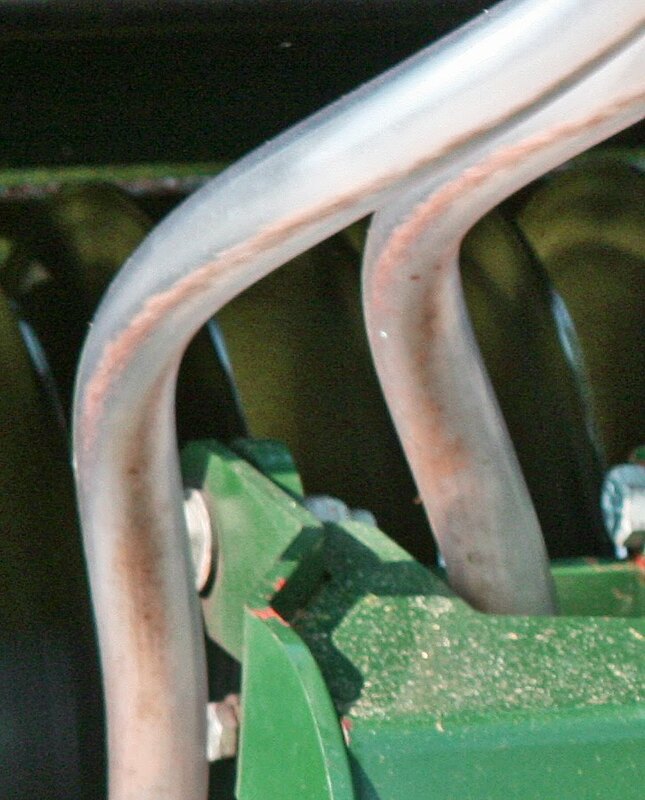 This slightly smaller tine will be less invasive than last September’s process when we double aerified using both 1/2 inch tines and 3/4 inch deep-tines. 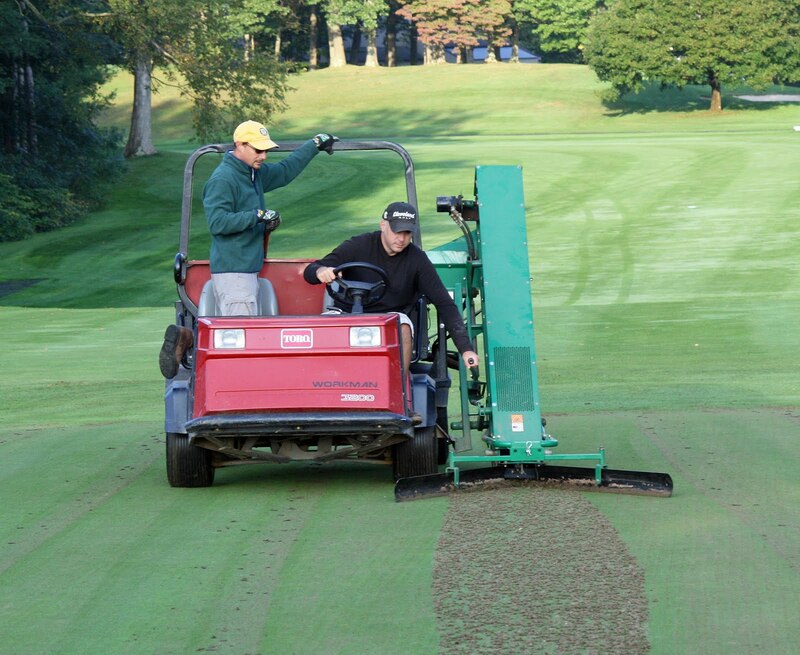 This year we decided to do our deep-tine aerification in early to mid-November to improve October playing conditions. 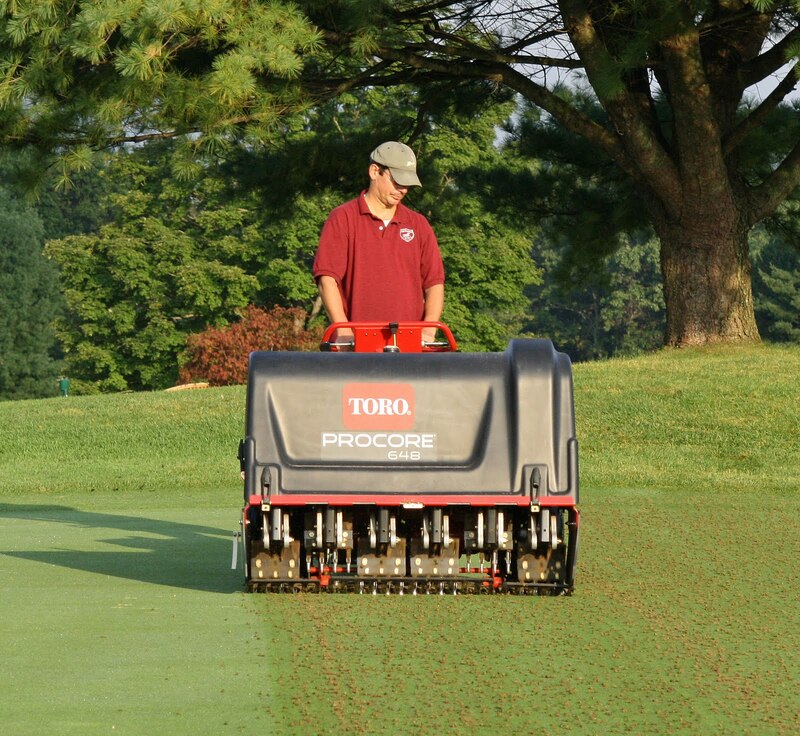 Deep-tining of the greens will be performed with 1/2 inch tines instead of 3/4 inch tines. This will improve the early season healing in 2011. Late September aerification always poses its challenges because the days are shorter and the temperatures are cooler. Obviously, shorter work days make it harder for the staff to complete the job quickly. Cooler temperatures and the lower angle of the sun means it takes longer for the sand to dry, in turn, lengthening the topdressing process. In addition to the above mentioned challenges, we will be getting a slightly later start (Wednesday AM). Normally we get a head start because we can begin on Monday afternoon after the morning outside event. This year we have happily added a Tuesday afternoon outside event. I would like to reiterate that aerification is the single most beneficial cultural practice we can perform on fine turfgrass. 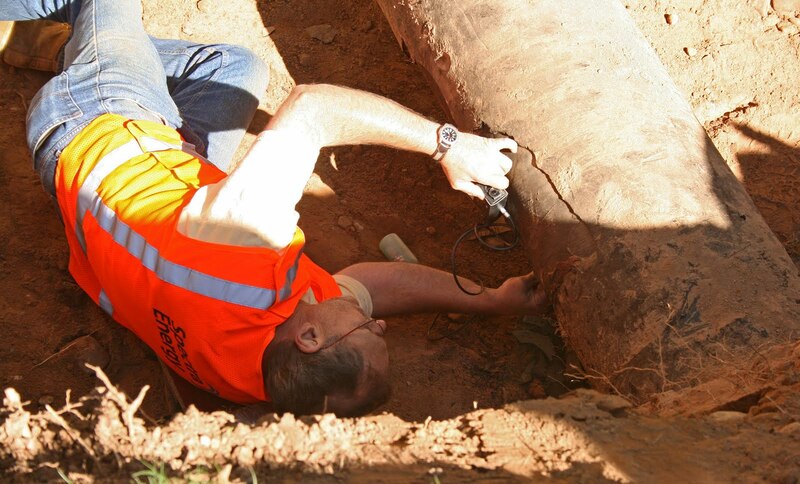 It is the cornerstone of our maintenance program. Without it we would not have been able to survive a summer like the one experienced this year. The repair to the sixteen inch gas main is going smoothly. The crew is ahead of schedule and will be backfilling the hole tomorrow if the repair passes the final inspection. It is quite an interesting process. 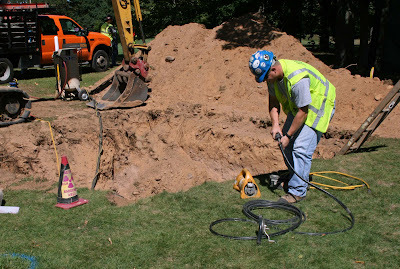 The gas line repair began this morning. 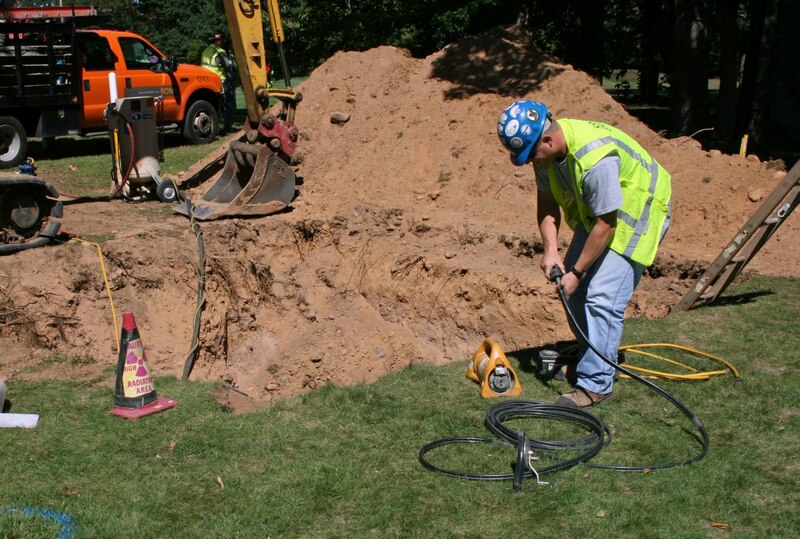 The first order of business was for Algonquin Gas Transmission (Spectra Energy) to get their equipment set up and install a temporary safety net. They started to dig by 8am. 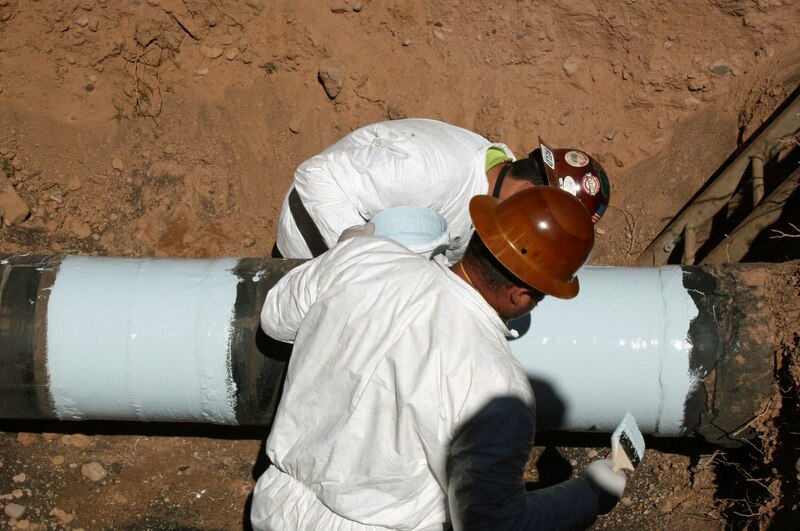 The project should be completed by Friday afternoon. I'll continue to update you with their progress. Who Is Cutting Traffic Ropes At The Farms CC? Help Solve The Mystery! I find it unfortunate that I actually have to broach this subject on my blog. 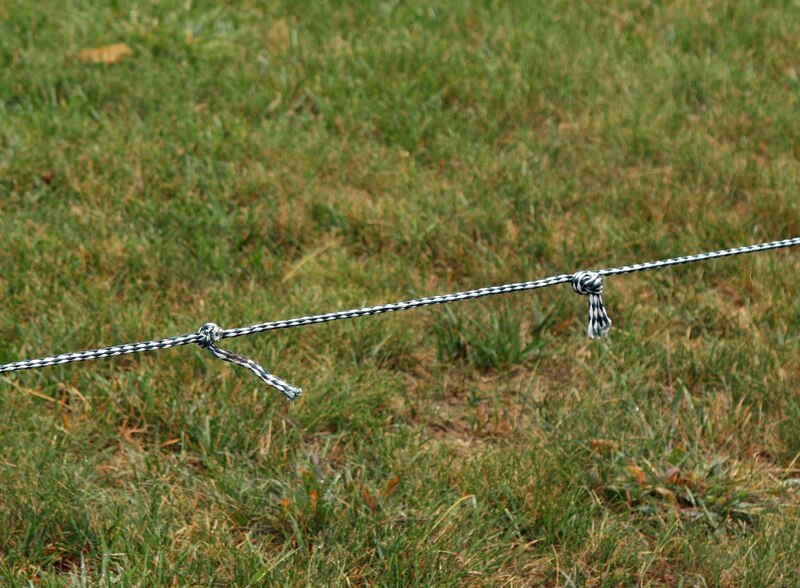 Throughout the season we have been finding that traffic ropes are being cut. Originally I thought it was just a couple of isolated incidents but it is actually getting worse. Yesterday as I headed back to the maintenance facility around 3:45pm, I noticed several ropes were cut again. I know they were fine in the morning. The vandalism always happens during the day and it's never when we have an outside event. 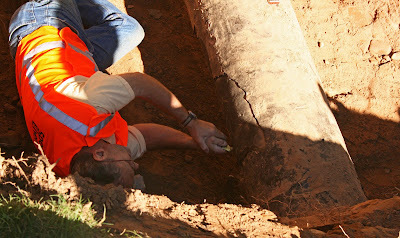 It may seem like a simple maintenance inconvenience, but it's more than that. We started by replacing large sections of rope to eliminate the unsightliness of tying knots, but it started to cost too much money as more and more sections were cut. 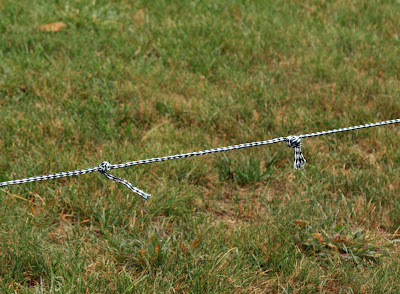 We are now forced to just tie knots in the ropes because of budget constraints. 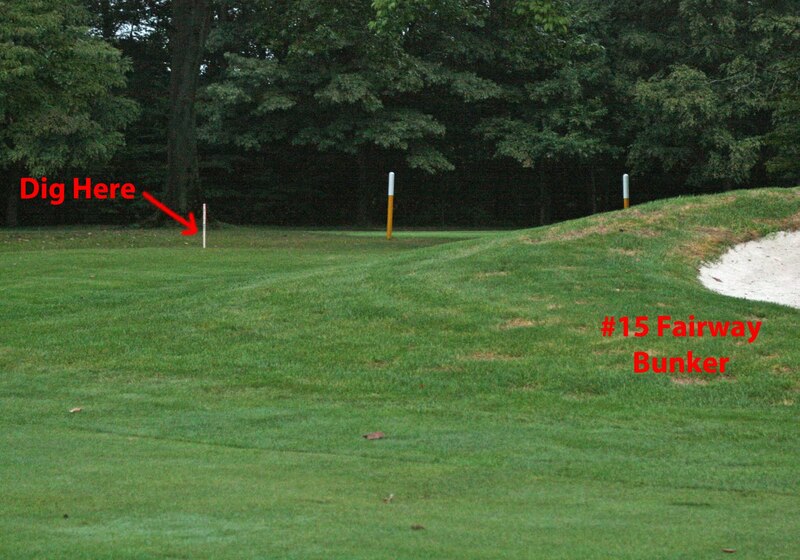 More importantly, when ropes are cut, carts can then go into important "play" areas and damage the fine turf. Please help the grounds crew solve the mystery! We don't care who is doing it. 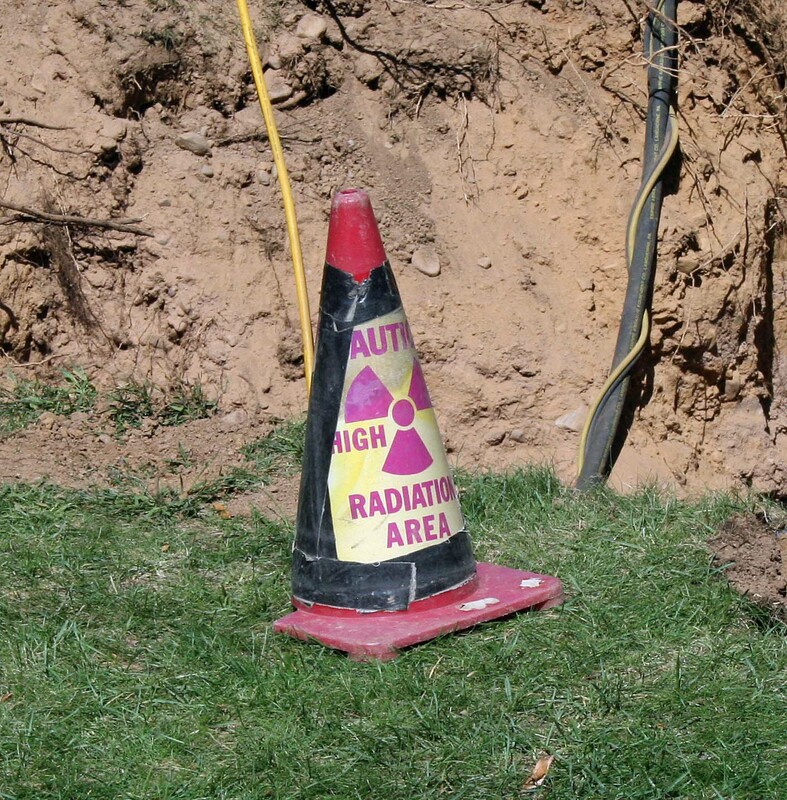 We just want it to stop so we can focus our attention and budget dollars on more constructive maintenance practices. Hugh Kurtz & Dennis Damato! 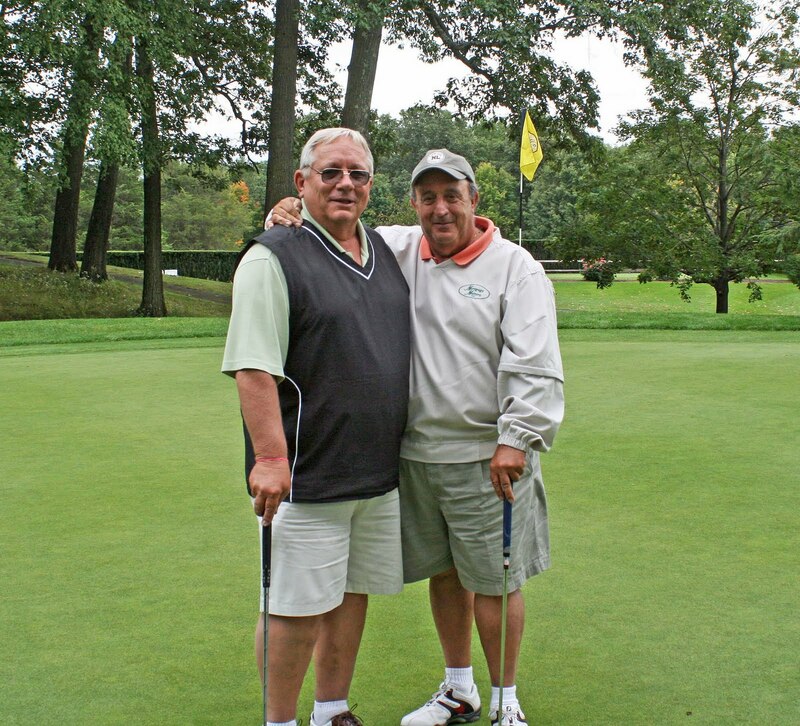 Winners of the Men's Fall Member Member! 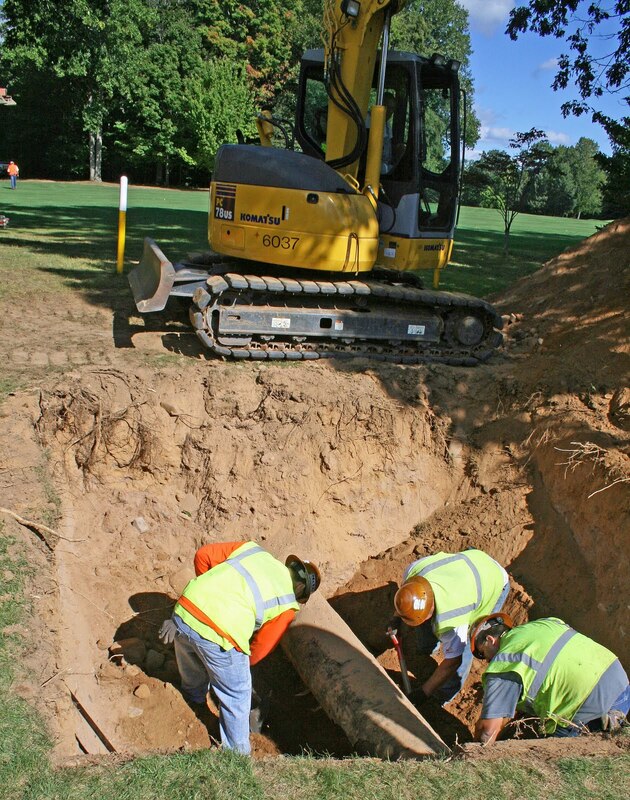 Algonquin Gas Transmission (Spectra Enery) will be repairing one of their main lines in the far right rough on hole #15 beginning Wednesday September 15th. They should be finished by Friday September 17th. They have an issue with the coating on one of the lines. 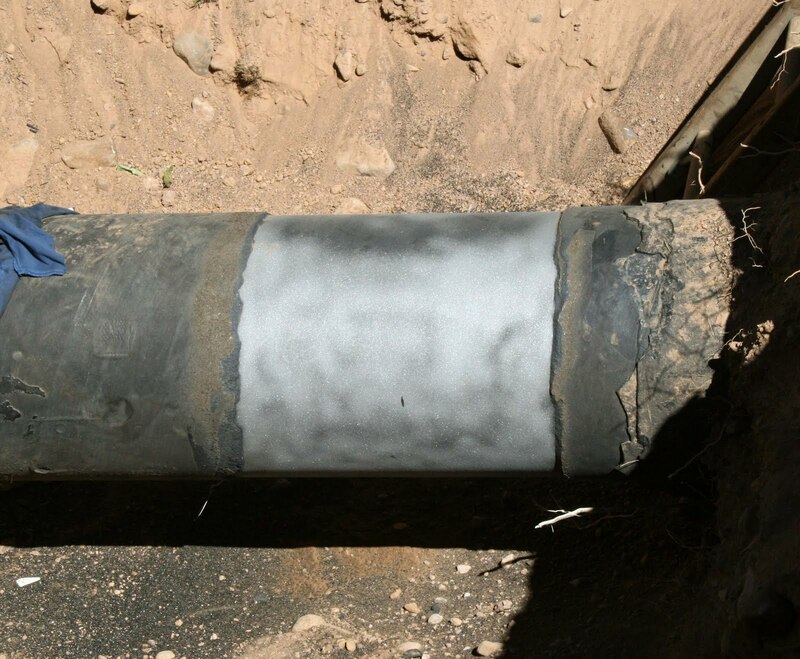 They will dig up a small section of the pipe, clean off the existing coating and re-coat it. They were kind enough to work around our tournament schedule to keep any inconvenience to our members at a minimum. I will update you as I recieve more information. Below is a sattelite photo of the spot and a picture of the stake marking it. So far so good! 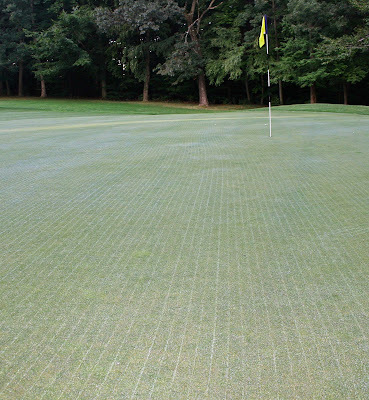 The seed has started to germinate on greens #12, #13 and the practice green. Since it has only been seven days, this is a good indication that results from overseeding will be successful. I expect more seed to germinate over the next few days. The true success of this test project will be determined not only by germination but survival of the tender young plants. The photos below were taken this morning. 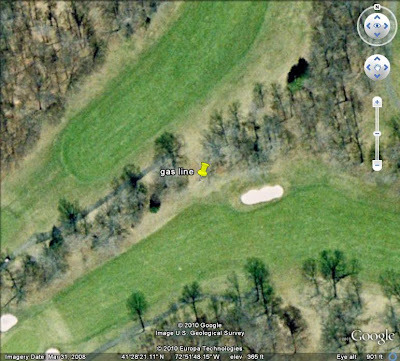 I’m proud to announce that I will be blogging for CTGolfer.com! 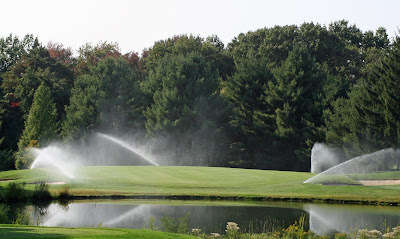 A couple of weeks ago Bob Samek, publisher of CTGolfer.com & CTGolfer Yearbook, contacted me to ask if I’d be interested in running a Golf Course Superintendents Blog for his web site. He was looking for a different industry perspective to compliment the already impressive blog team he had in place. 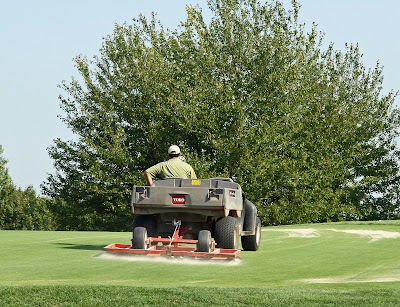 After careful consideration, I decided this was a great opportunity for me to help a wider range of golfers understand what we do in the golf course maintenance field. 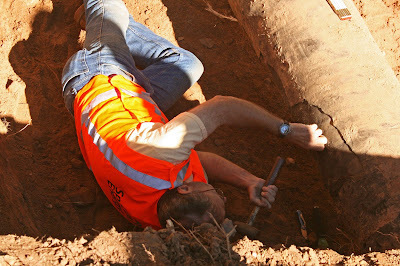 I will be writing about a variety of maintenance and management subjects in my spare time. I hope to hear from you. My first post is already entered! It must be September! 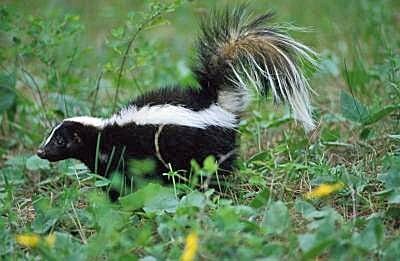 Every year we experience some late season Striped Skunk damage. 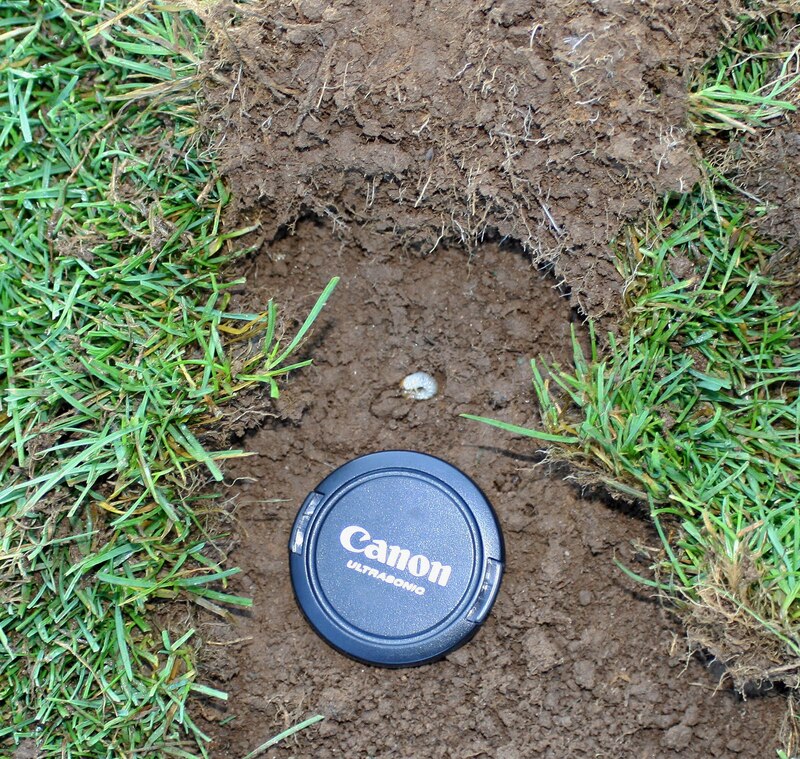 The damage is usually localized and is an indicator as to where we have white grubs in the turf. White grubs are one of the primary food sources for skunks. The damage is almost always in the rough where we don't treat for grubs. 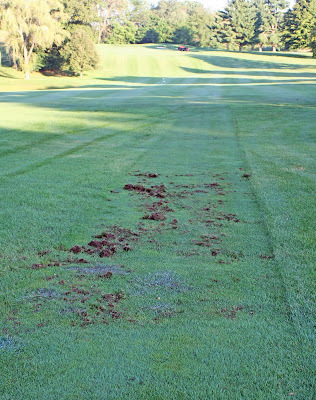 All tees, greens and fairways are treated with insecticide to avoid this type of damage. 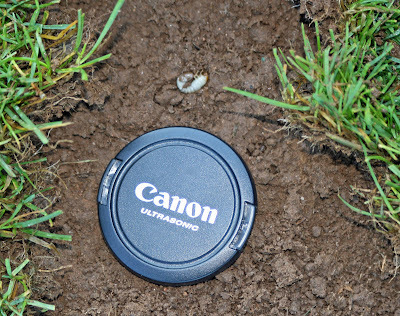 White grubs, themselves, can also inflict severe damage to turf roots. 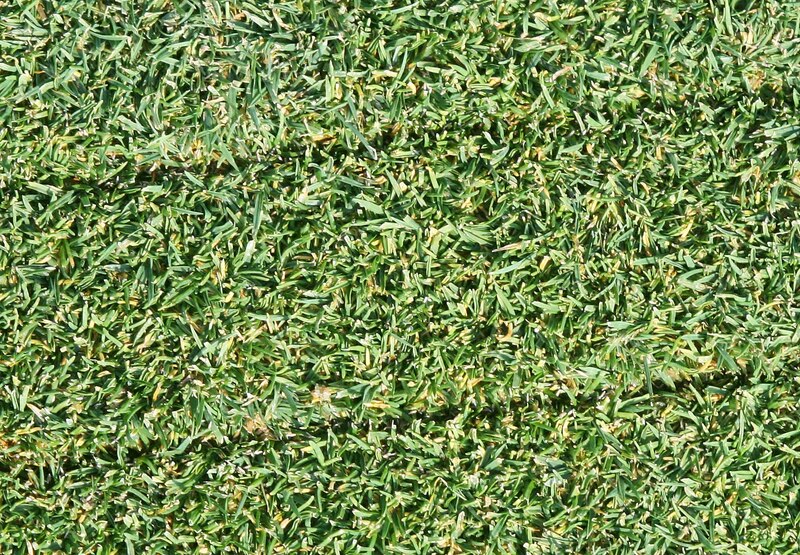 Especially in the shorter cut turf. 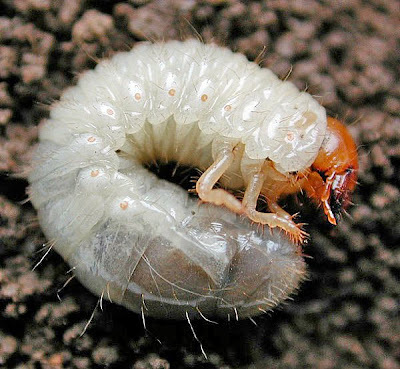 The cost to treat for white grubs in the rough would be very expensive. The turf in our rough is much stronger and is able to withstand minor white grub populations. 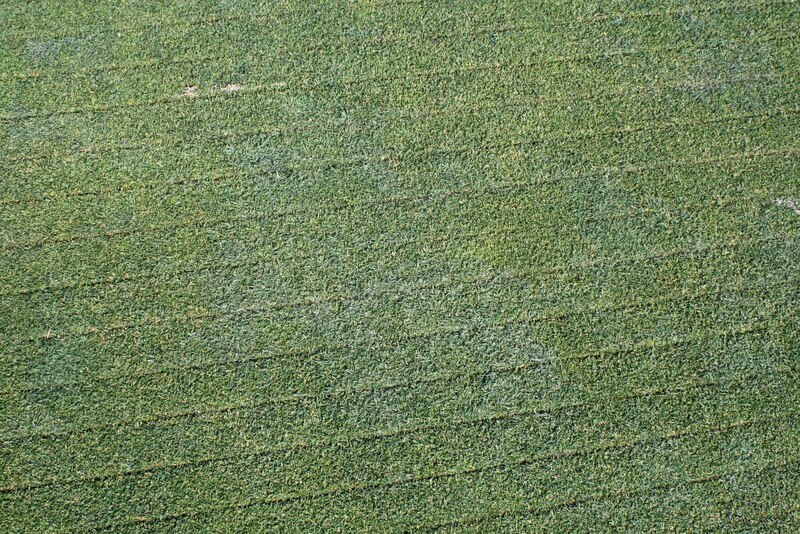 I call it the "Agronomic Threshold". 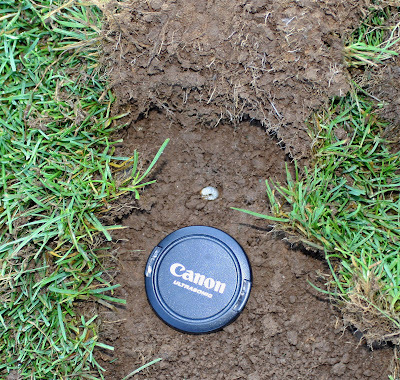 By definition, this is the line in which turf can endure pest damage, of any kind, until it reaches a point where there is a dramatic reduction in quality, health and playability. 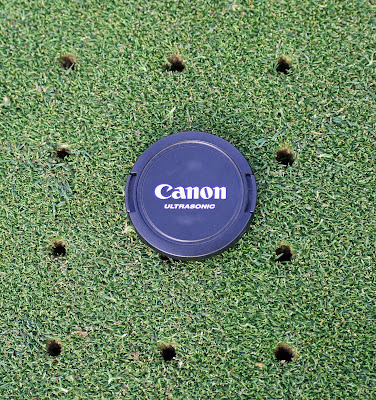 When we see indicators, like skunk or black crow damage, we spot treat the localized area. 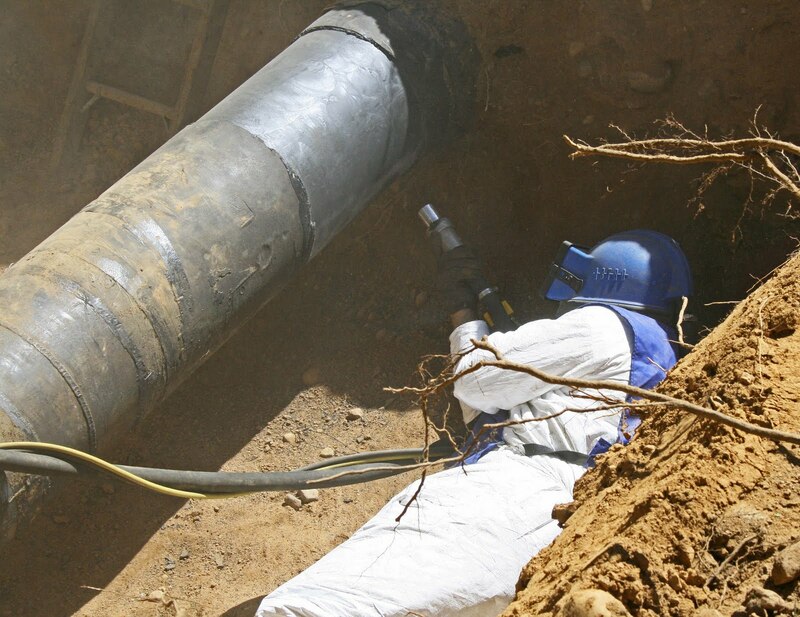 This is much more cost effective and environmentally friendly than blanket pesticide applications. The USGA Green Section has published "What Happened and Why" videos for all regions explaining, in detail, what all golf courses have gone through this record breaking summer. The video below is very informative. Please spend the time to view it. It's been a rough year for golf courses and the professionals who care for them. 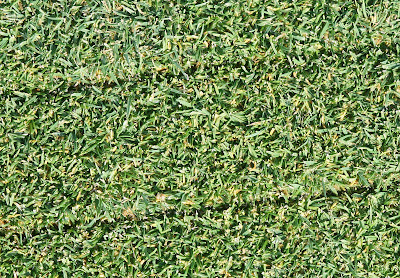 This past summer proved one of the worst ever for growing bentgrass and Poa annua. In fact, damage this summer was so widespread and severe that we are devoting this entire issue of the Record to this topic. 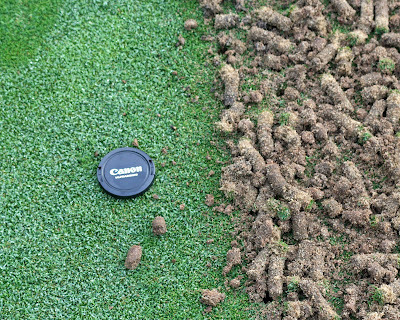 We believe it is extremely important to make golfers aware of one of the most prominent factors that generated so much damage to greens - the expectation for very fast greens all year round. To meet these expectancies, superintendents are mowing lower throughout the summer months when the bentgrass and Poa annua are most susceptible to injury. 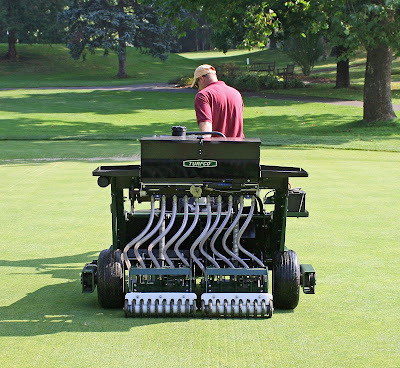 The combination of low mowing, abnormally high temperatures, and other stresses simply proved too much, and in many instances resulted in the complete loss of putting greens throughout all Green Section regions. We can all learn a lot from this past season. 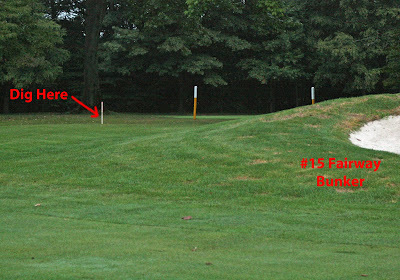 Perhaps the most important lesson is to recognize that pushing greens too hard can place them on the edge of failure. A local equipment distributor, Steve Willand Co., was kind enough to let us "demo" a new style of overseeder today. 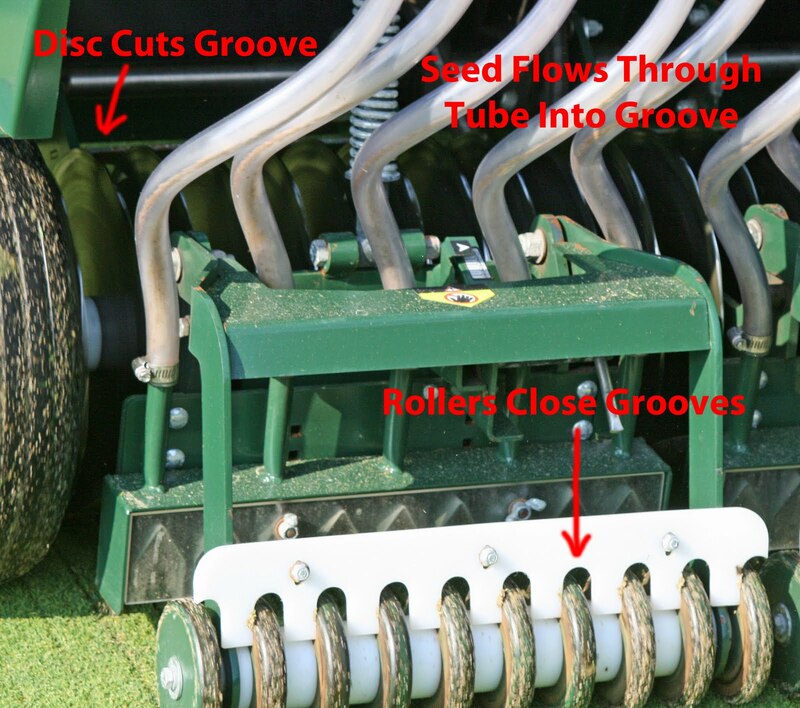 I have heard very good reviews about the Turfco overseeder and the timing is perfect to achieve the maximum germination of seed. 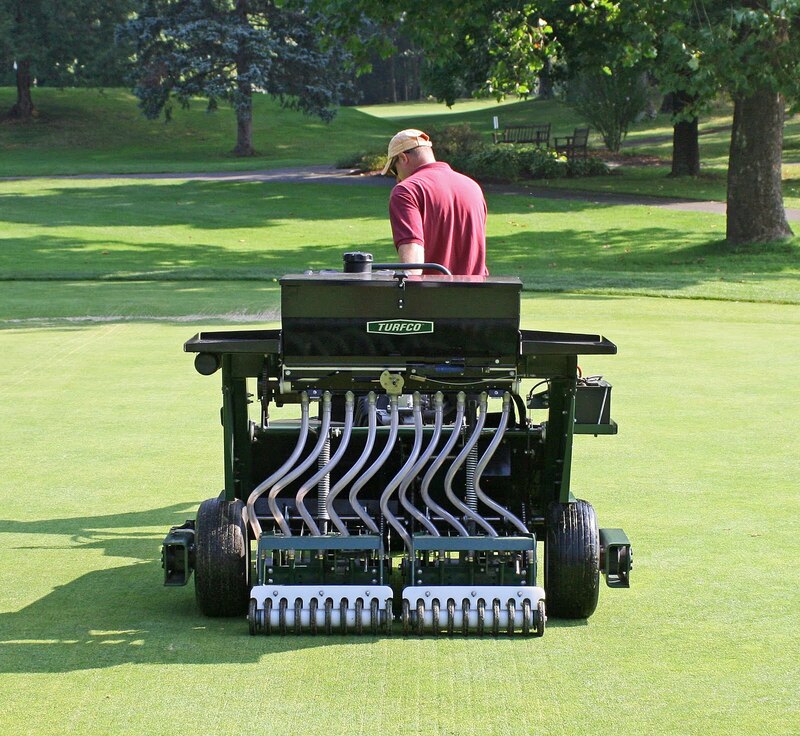 To fully take advantage of the free use of this machine, I made the decision to overseed greens #12 and #13 in addition to the practice green. Greens #12 and #13 have shown the most signs of thinning and the addition of more creeping bentgrass is our best option for improvement. 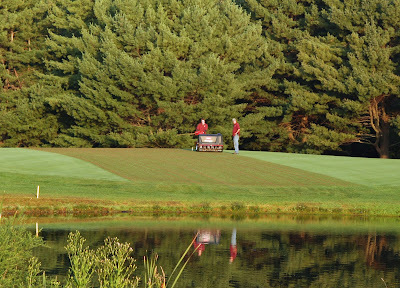 It is also the best way to reduce the high percentage of the undesirable Poa Annua that populates these greens. While there is some surface disruption, it is minimal. 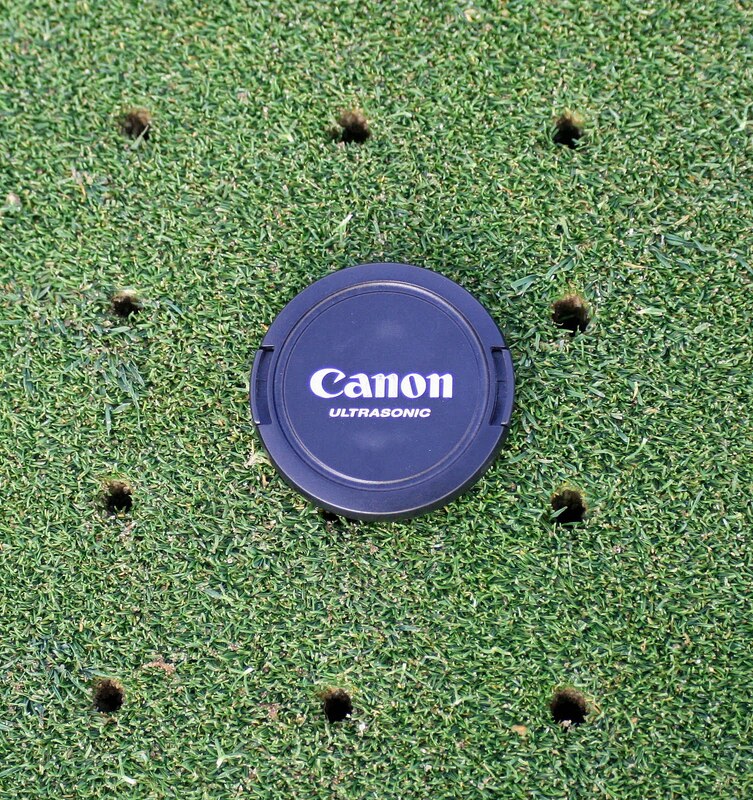 The putting surfaces will be just fine in a couple of days. The true test of this machine will be the germination results we hope to see in the next week or two. I will follow up at that time.